A European tour…it should include the most popular and exciting cities, the must-see sights, picturesque scenery, and a mix of culture, history, and just plain fun. On this Best of Europe tour, you’ll experience all of this and more. 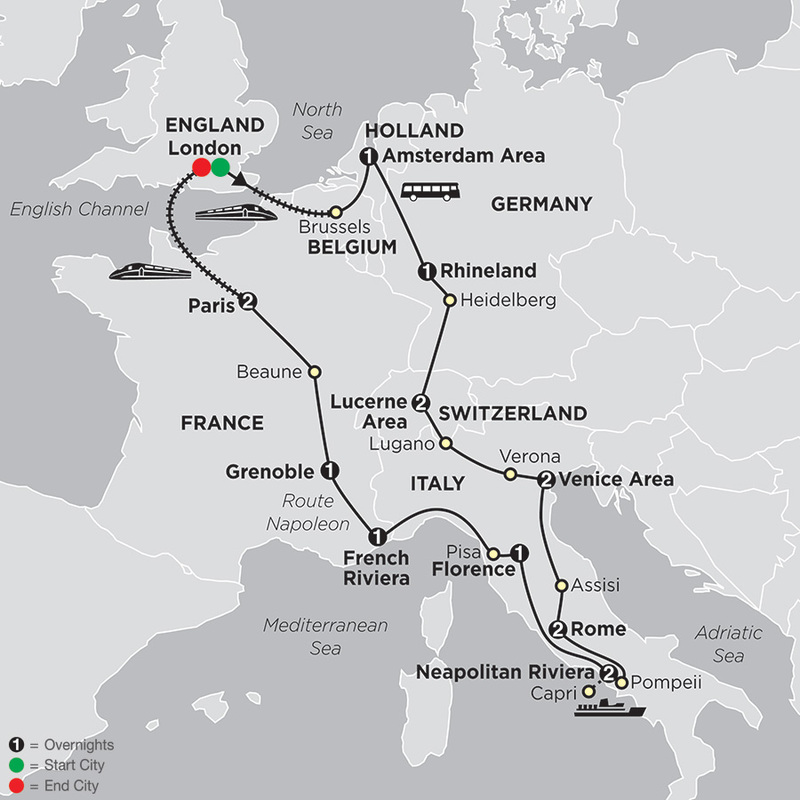 You’ll stay overnight in the Amsterdam area, Germany’s Rhineland, the Lucerne area, the Venice area, Rome, the Neapolitan Riviera (with one of Europe’s most breathtaking stretches of coastline), Florence, the French Riviera, Grenoble, and Paris. On guided sightseeing tours, you’ll visit the must-see sights—including those that will delight history fans—such as Lucerne’s Chapel Bridge, built in the 14th century as part of the city’s fortifications and now Europe’s oldest-preserved wooden bridge; Pisa’s famous Leaning Tower; Rome’s Colosseum and Roman Forum, dating back to the Roman Empire; Assisi’s Basilica, dating to the 1200s; Pompeii, where you’ll see what life was like during the Roman Empire before Mount Vesuvius destroyed and preserved the town in 79 AD; and much more. On this comprehensive European tour, you’ll also enjoy spectacular scenery. You’ll drive through the picturesque Rhineland with its scenic countryside, historic castles, and charming villages, and you’ll enjoy breathtaking drives and time in the Italian Riviera and French Riviera. Sit back and relax as you drive past the Burgundy vineyards in France and through gorgeous alpine scenery from Switzerland to Italy. Marvel at the beauty in Tuscany with its rural villages, rolling hills, vineyards, rows of cypress trees, and olive groves. You’ll stand in awe as you witness the blue sea and amazing views on the legendary island of Capri, and you’ll get a different perspective of Amsterdam as you cruise on its canals. AMSTERDAM AREA–RHINELAND, GERMANY. Today, enjoy sightseeing in Amsterdam with a Local Guide pointing out the city highlights, followed by a CANAL CRUISE to see the city from water level, then stop to watch the cutting and polishing of precious stones at a DIAMOND CENTER. This afternoon, continue your journey to the scenic Rhineland. RHINELAND–HEIDELBERG–LUCERNE AREA, SWITZERLAND. Drive through the picturesque Rhineland or, alternatively, take the optional Rhine River cruise and enjoy splendid scenery including the Lorelei rock. Next, drive into Germany’s oldest university town, Heidelberg, nicely located at the confluence of the Neckar and Rhine Rivers, for a short visit. Continue to the Lucerne area. LUCERNE AREA. One of Switzerland’s finest cities, Lucerne is nestled amid its snowcapped Alps, surrounded by its lake, and graced by the clear mountain waters of the Reuss River. The orientation includes the LION MONUMENT, erected in memory of the 800 Swiss Guards who defended Louis XVI and his wife, and the wooden CHAPEL BRIDGE. A grand selection of optional activities completes the day: a cable-car ride to the 10,000-foot summit of Mount Titlis; a cruise on the fjord-like lake; and, of course, time to shop for an authentic Swiss watch. LUCERNE AREA–LUGANO–VERONA, ITALY–VENICE AREA. More wonderful alpine scenery as you drive into the mountain ranges that surround the massive St. Gotthard leading to the warmer and sunnier ambiance of Canton Ticino. Stop in beautiful Lugano and take a stroll along the lakeside promenade. Then, cross into Italy and drive across the Po Valley to Verona, medieval setting of Shakespeare’s Romeo and Juliet. See Juliet’s house and balcony, and stroll around the picturesque market square. Tonight, you are in the Venice area. VENICE AREA. Venice is more like a marvelous film set than a real-life city, with its criss-crossing canals, gondolas and water buses, arched bridges, palaces, and busy little piazzas. The included orientation starts with a BOAT RIDE to St. Mark’s Square and is followed by free time to soak up the city’s unique atmosphere and a chance to visit a GLASSBLOWING WORKSHOP. Don’t miss out on the optional gondola trip, gliding along the picturesque canals with a local troubadour to serenade you. VENICE AREA–ASSISI–ROME. An interesting drive southward, crossing the rolling Apennines. Stop in medieval Assisi, where St. Francis was born in 1182, and visit the world-famous BASILICA with its beautiful frescoes by Giotto. Then, head for Rome. ROME–POMPEII–NEAPOLITAN RIVIERA. South all the way today, with the Vesuvius volcano in the distance. Visit Pompeii, where time stopped in 79 AD when the Vesuvius eruption totally buried it. On the included visit to the ARCHAEOLOGICAL SITE, see the luxurious villas, temples, theater, and forum. Just a few more miles to reach the lively Neapolitan Riviera. NEAPOLITAN RIVIERA. EXCURSION TO CAPRI. Cross the blue sea for a full-day excursion to the legendary island of Capri. Surrounded by rose-tinted rocks, Capri has incredibly beautiful coves of translucent blues and greens. The town, with its pretty piazzetta, maze of streets, fashionable boutiques, and cozy restaurants, is a mecca for the jet set. An optional tour takes you around the island with its steep roads and panoramic views. NEAPOLITAN RIVIERA–FLORENCE. An early journey north to Florence. Vistas of rolling hills, austere rows of cypress trees, terraced vineyards, olive groves, and rural villages form the backdrop of your journey through beautiful Tuscany. Arrive in Florence in the afternoon in time to enjoy its magnificent architectural and artistic treasures; the included walking tour with a Local Guide will take in the highlights. FLORENCE–PISA–FRENCH RIVIERA, FRANCE. Stop in Pisa to see the SQUARE OF MIRACLES and the famous Leaning Tower, 180 feet high and no less than 12 feet out of the perpendicular. Bypassing the great port of Genoa, drive northwest, getting glimpses of the Italian and French Rivieras. Stop in Eze to visit an interesting PERFUME WORKSHOP and reach the shores of the charming Côte d’Azur. FRENCH RIVIERA–ROUTE NAPOLEON–GRENOBLE. Today we follow the footsteps of Napoleon as he escaped from exile in Elbe. Once he landed on the shores of the Côte d’Azur, he made his way to Paris via Grasse. Following the Route Napoleon from St André Les Alpes, reach Grenoble, an alpine town that hosted the 1968 winter Olympic Games. GRENOBLE–BEAUNE–PARIS. Enjoy the very heart of the Burgundy wine-growing region, making a stop in lovely Beaune, surrounded by some of the world’s finest vineyards. Continue northwards to the exciting city of Paris, capital of France. PARIS. Paris is a world-class city that probably has more familiar landmarks than almost any other city in the world. This morning, see the main ones during the included city tour with a Local Guide. In the afternoon, a chance to feel like a French aristocrat as you join the optional walking tour through the immense Palace of Versailles. This evening, why not join an optional farewell dinner? "Travel through Europe offers a taste of different cultures. What is an Ausfahrt? No, it's not Aussie flatulence. Have you ever played music with a saw? The Austrians and Swiss do. Come to Europe with a healthy appetite and light suitcases. You're sure to return home with a bit of extra weight (bags AND tummy). I look forward to sharing this travel experience together and seeing Europe through your eyes!"